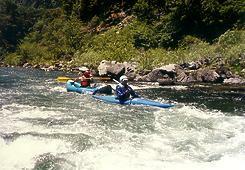 This is the best run for novices on the Trinity, with pleasant scenery and fun class II rapids from beginning to end. In years past, rains have triggered slides into the river, creating class III rapids for several years, but the river gradually erodes these back to class II. The good rapids end just above the South Fork confluence, but taking out there is difficult, involving a steep climb and a .1 mile carry up an old dirt road now lined with poison oak. If you prefer, continue another 5.8 miles to the Willow Creek airport and gravel bar, where you can drive vehicles right down to the river. A problem with adding these 5.8 miles is that upriver winds can become very strong in the afternoon, sometimes blowing boats back upstream. Here is the latest Flow Release Schedule for Lewiston Dam. There are two good USFS campgrounds nearby: Tish Tang between Willow Creek and Hoopa, and Gray's Falls just east of Hawkins Bar. The Burnt Ranch campgrounds are OK, but seem to have mosquitoes all summer long. There are nice motels and Indian casinos in the town of Hoopa. Put in at some convenient place on the wide willow-covered gravel bar. 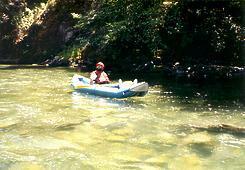 Class II rapids begin immediately. Devil's Elbow, a horseshoe bend, with many sandy beaches. This area is popular with sunbathers, because a trail leads down from Tunnel Flat Rd, off highway 199, to the left bank. Alternate take-out on river right, at a big lazy bend to the left. This avoids flatter water ahead. To reach this legal take-out, granted as a zoning variance when a new subdivision was built, cross the bridge from highway 299 to Salyer, and take all right turns. A locked gate makes parking and access less convenient, and the trail down to the river might be somewhat overgrown. Town of Salyer, with bridge overhead. The banks are very steep, and privately owned, so taking out here is not advised. Confluence with the South Fork Trinity. 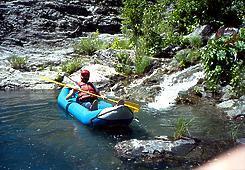 It might be necessary to paddle a few meters up the South Fork to find the best steps. If you don't mind carrying your kayak, this makes a good take-out. Rafts are problematic, because poison oak makes the old road too narrow for carrying an inflated boat. 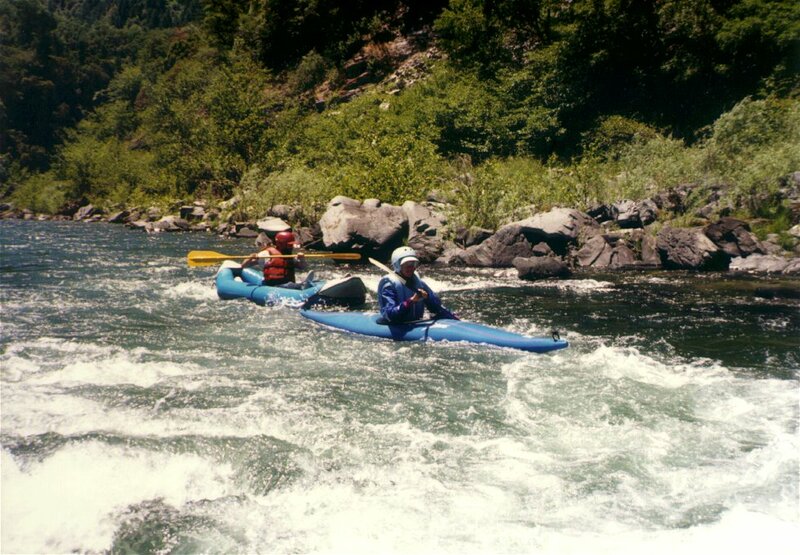 Rapids ease considerably, becoming mostly class I-II drops over gravel bars. Headwinds can be a problem in late afternoon. Bridge across river, near town of Willow Creek. Taking out here would be legal but difficult. Big Rock, a monolith on river left buried in a wide gravel bar. The Willow Creek airport and gravel bar are nearby. Compacted flat-rock gravel makes it easy to park near the river. 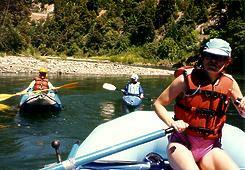 To reach take-out, follow highway 299 until it crosses the South Fork Trinity, and park near the bridge. An old road descends to the confluence from the the east bank of the South Fork (the west bank is private land). To reach put-in, follow highway 299 to the town of Hawkins Bar. A sign points to river access on the northest side of the highway, where a dirt road descends to the river over USFS land. In most years 4WD is not necessary, although the road can be rough in spots. While you're in the area, consider combining this run with other ones on the Trinity. If you're short on time, try the run from Riverdale Park to Tish Tang campground, which is mostly class I-II with one good class II+ rapid. If you're up to running or portaging a class III rapid, try the run from Hoopa to the confluence with the Klamath, which provides generally easy rapids in a scenic canyon. 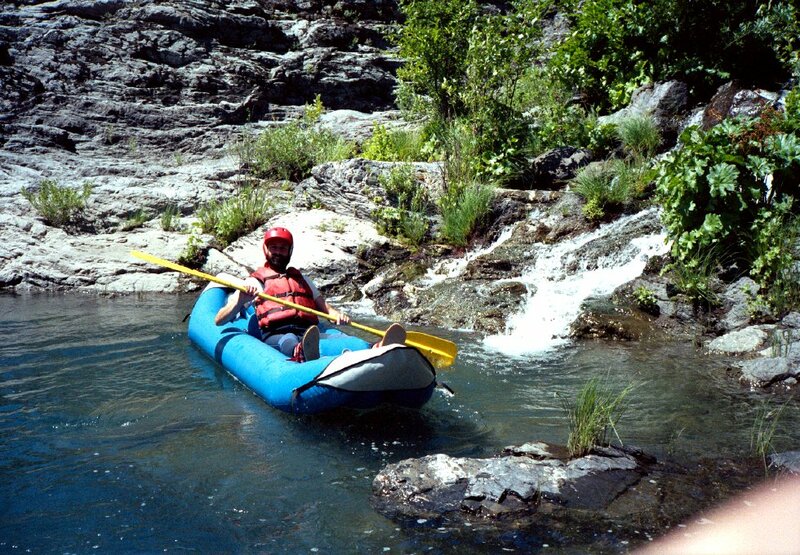 If you found this Salyer run too easy, go upstream and try the run from White's Bar to Cedar Flat, which offers several good class III- rapids.